High school pupils and university students who are thinking about the next step in their educational careers will have all their questions answered when the national Student Expo comes to Centurion on September 23 and 24. 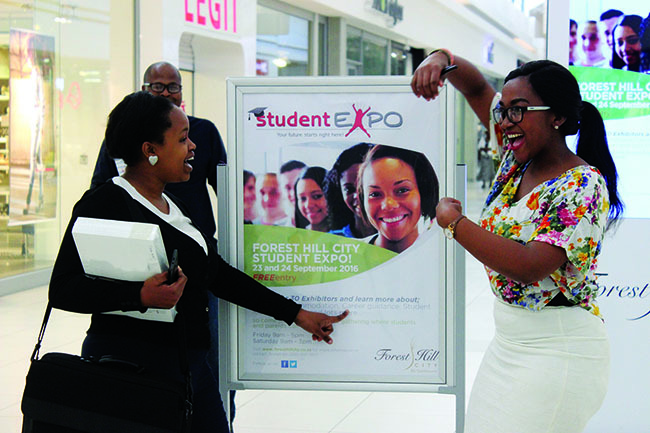 The first Student Expo for Centurion will be hosted by Forest Hill City Shopping Centre. The two-day exhibition features over 25 exhibitors offering information and advice on everything from career guidance, bursaries and study loans to student accommodation and transport. All schools in the greater Tshwane area have been invited to bring their Grade 10 to 12 classes to the event. Also held in Johannesburg, Cape Town and Durban, the Student Expo is billed as “South Africa’s only exhibition that is designed to provide both current and prospective students with the necessary tools to succeed in tertiary education and beyond”. “By gaining an in-depth understanding of what university life entails, pupils will be better equipped to make the right choice of what to study and where, and won’t have to feel stressed about their future,” said Annah Moremela, Forest Hill City acting general manager. The event dovetailed perfectly with the mall’s vision to support educational initiatives and those that uplift young people in the local community, she said. The expo is divided into seven zones including the tertiary educational zone – where universities, colleges and specialist academies present their range of courses – and the financial zone, where financial institutions are on hand to help with the set-up of bank accounts, loans and insurance packages. The expo’s recruitment zone is the space for graduate recruitment companies and companies with graduate programmes to meet with promising candidates about career opportunities, while the gap year/work and travel zone provides exciting alternatives for those wishing to explore the idea of a “gap year”. The transportation and student accommodation zones take care of the practicalities of where to live and how to get around. Finally, a zone dedicated to the more social aspects – including student sports, the latest tech gadgets and fashion, hair and make-up – rounds out the offering. The student Expo runs from 9am to 5pm on the Friday and from 9am to 3pm the following day. For more information, contact centre management on 012 007 0917 or visit www.foresthillcity.co.za.